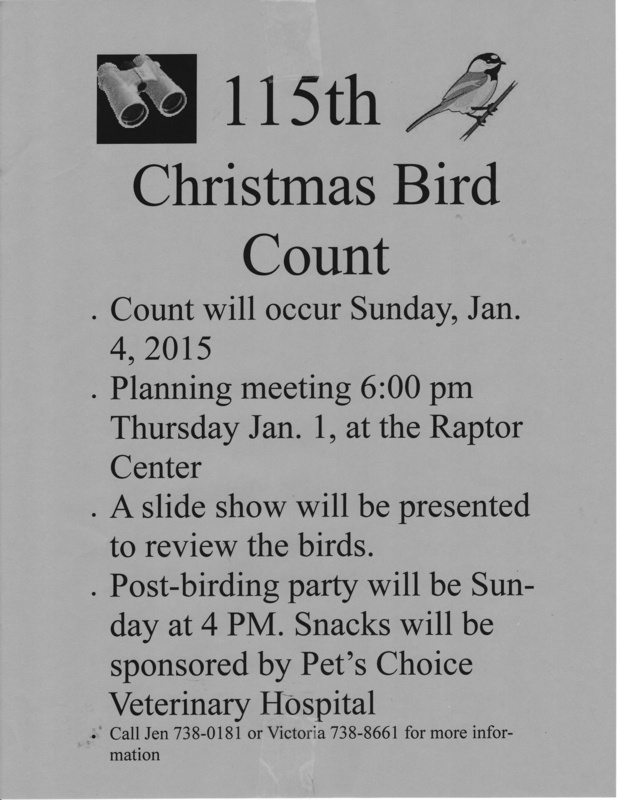 Sitka to host its local Christmas Bird Count event on Jan. 4 | Get Out, Sitka! This year is the National Audubon Society‘s 115th annual Christmas Bird Count, and Sitka will be one of several Alaska communities to host a local event, with Sitka’s event set for Sunday, Jan. 4. During this event, local teams will hike around various sections of Sitka in an attempt to count as many different birds they can find. There will be a planning meeting at 6 p.m. on Thursday, Jan. 1, at the Alaska Raptor Center. After the event, there will be a slide show to review the various birds seen in Sitka. There is a post-birding party at 4 p.m. Sunday at the Alaska Raptor Center, and snacks will be sponsored by Pet’s Choice Veterinary Hospital. Sitka birders who want to practice for the Christmas Bird Count can participate in a free bird walk from 10-11:30 a.m. on Saturday, Dec. 27, at Sitka National Historical Park. 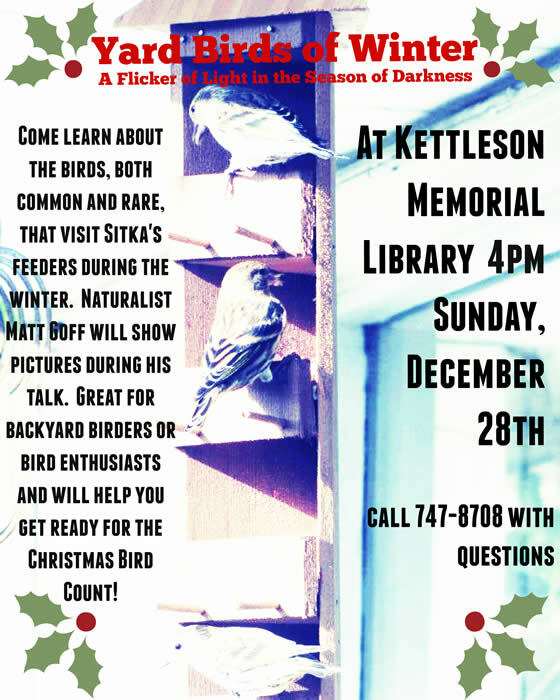 There also will be a Yard Birds of Winter presentation by Sitka naturalist Matt Goff at 4 p.m. on Sunday, Dec. 28, at the Kettleson Memorial Library’s temporary home (the old Sheldon Jackson College Stratton Library building). The Christmas Bird Count, which started nationally in 1900 with Alaska’s first event in 1941, involves thousands of bird-watchers, hikers, nature lovers and more each year. The count is for a 24-hour period and local events can take place from Dec. 14 to Jan. 5 this winter to still count. Last year the Alaska Audubon Society reported Alaska counters saw 139 species and 124,854 total birds, which was lower than usual. 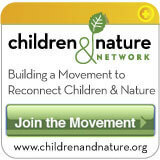 This entry was posted in Kids and nature, Outdoor events, Training and tagged Alaska, Alaska Audubon Society, Alaska Raptor Center, Audubon Society, birds, Christmas Bird Count, discovery and exploration, education, encouragement, fresh air, get more kids outdoors, Get Out Sitka!, Have you been outdoors today?, healthy physical activity, hiking, Jen Cedarleaf, Kettleson Memorial Library, Matt Goff, National Audubon Society, Pet's Choice Veterinary Hospital, Sheldon Jackson College Stratton Library, Sitka National Historical Park, Sitka!, Southeast Alaska, Victoria Vosburg DVM, Yard Birds of Winter. Bookmark the permalink. Pingback: Explore the fascinating world of ducks during a free film at Sitka National Historical Park | Get Out, Sitka!